My Sweet Haven: On Top of a Hill or at the Beachfront? My current dilemma is having to choose between two equally wonderful locales for my Philippine wedding reception. This ain't the final two yet but for now, my mind is set on these two venues. I'd like my reception to make my guests feel closer to nature. So I've always wanted an outdoor venue. My original choice is at the beachfront. I know this shouldn't be a difficult choice since Cebu has a lot of very wonderful beaches. But I also have certain conditions. I wouldn't want it to be right on the sandy shores. I want my guests to admire nature at the same time feel comfortable without having to worry about sands getting on their feet. Another thing that I consider is the price of the package. Reception venue rates can be pretty ridiculous nowadays. I want it to be within our budget. And I think VistaMar Beach Resort in Mactan is the right choice for us. I have here two pictures of the place that I grabbed from my friend Hazel's Multiply site. She also had her renewal of vows at VistaMar and she recommended this place to me. It's a perfect venue for small and intimate weddings. 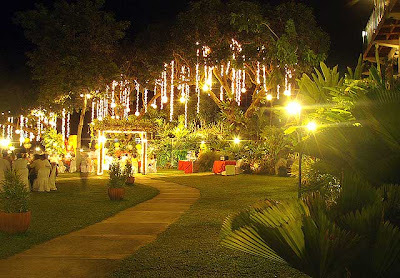 But after searching for more wedding inputs online, I came across with a forum that talks about Cebu weddings and there I saw another perfect venue for a simple and romantic setting. 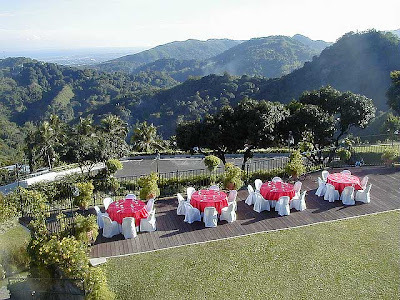 The place is Chateau de Busay, a haven that is nestled on top of a hill with a breathtaking view of lush green mountains and overlooking the magnificent city of Cebu. Ok, I must admit, I am a sucker for a great, romantic view. By looking at my choices, you probably realized it by now. 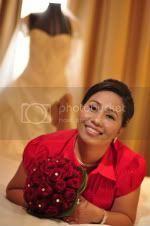 dont forget to invite me ha... lol.. hire a wedding.. "Here's the link coordinator.http://www.rightconnect-weddings.com/ mao ni among wedding coordinator and i did not regret having them.. wa jud hassle.. then included na MC.. very professional. hi jen,nindot ang location,very picturesque ang view.naa ko question,i thought dli puede mag church wedding sa beach or anything else aside from the church itself. Such a nice place this is. I like it! How are things for you? Haven't been here for quite awhile now. I hope you're ok. Just to let you know I was here visiting you. hello tejenn!..thanks for the friend request..na add tana ka te...tuod I will add your link to my list ha...wow! renewal vow! how long have you been married? congrats a gain..balik balik rako dre! i love the both venues view wise. i have been to a couple of weddings that was held in Chateau de Busay. it was romantic but the food is not that great. Both places are beautiful!!! Really can't tell which one to choose, hehe!